Most of my life I’ve expressed my creativity through music as a classical violinist and currently as a rock-n-roll player with my band The MERJ. The inspiration for my SeaWeaves creations began during many walks with my dogs on the beaches of the North Shore, collecting sea glass. Another inspiration was a collection of vintage jewelry I inherited from my grandmother. 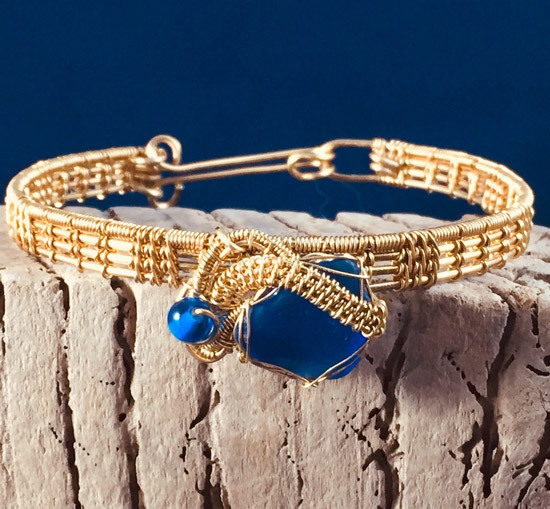 I’d seen wire wrapping, but I felt that was already being done by many artisans, and I needed to go beyond wrapping for a more personal expression. I found it in wire weaving. 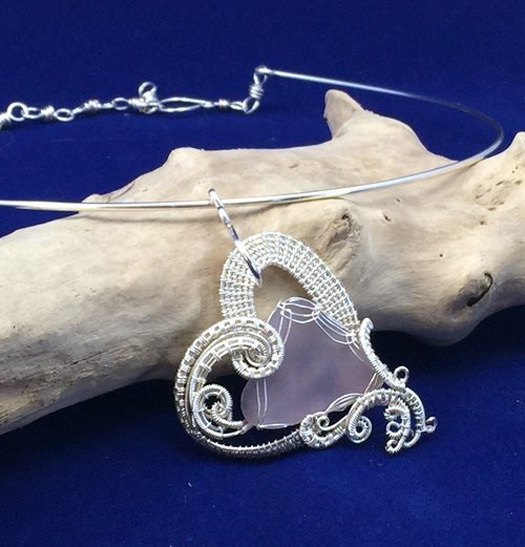 Wire weaving is a way for me to combine sea glass, vintage jewelry and creative expression. My approach to design is spontaneous; not planned, no templates, drawings, or jigs. No drills, no solder, no glue. I wanted to keep it organic as possible like the materials I use, simultaneously simple yet complex. As I’m creating, each design changes from moment to moment. I hope my art evokes memories of times at the beach, with loved ones, and the simple yet complex beauty of the ocean. 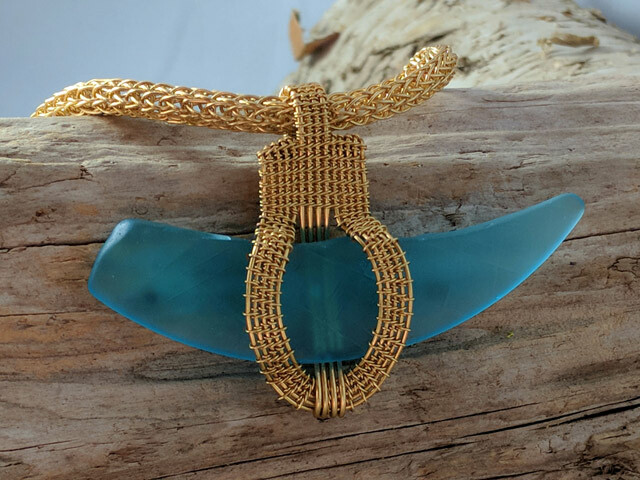 Imagine this, pick a beach from around the globe, take a walk on that beach and your eyes focus on a beautiful natural gem: a piece of sea glass. You pick it up for its beauty and for most people that’s where the story ends, but for me it’s where my inspiration begins. No solder, no adhesives, no drilling. 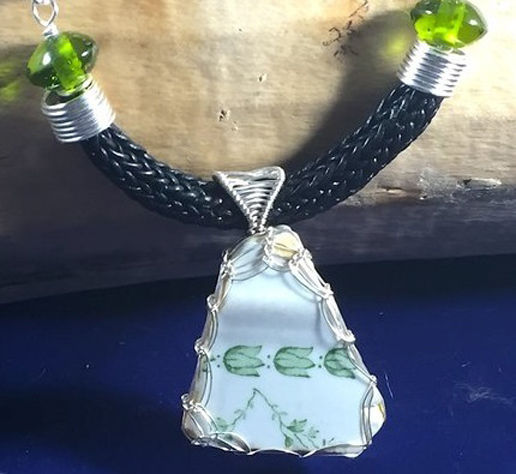 I enhance the natural beauty intricately weaving the sea glass with wire, leather and vintage jewelry. My work incorporates a high level of wire weaving that is complex, intricate and spontaneous. My hope is that through my jewelry you’re reminded of precious moments at the beach; your memories evoked through a wearable piece of art.